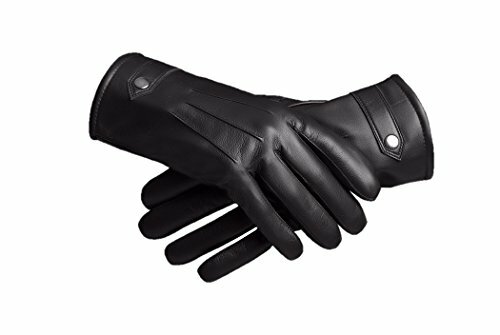 Beautiful and classic leather gloves by Baraca in black. The gloves is made from the nicest and softest sheepskin leather, and there are beautiful stitches. The gloves have a great fit and looks classy. Make the gloves look high quality gives your winter outfit. The gloves is lined with a soft and warm lining made of fleece. The gloves are soft can be used for any occasion: everyday use, party, wedding, business and dress..., Etc. The touchscreen gloves keep you warm in cold temperatures without affecting the use of your mobile device. GREAT UTILITY- Great for everyday use and driving, Cold weather travel, outdoor sports, riding, driving, etc.The absolute warmest touchscreen gloves. The gloves are soft can be used for any occasion: everyday use, party, wedding, business and dress..., Etc. The touchscreen gloves keep you warm in cold temperatures without affecting the use of your mobile device. If you have any questions about this product by Baraca, contact us by completing and submitting the form below. If you are looking for a specif part number, please include it with your message.